As gas prices begin to rise, so do the number of products that promise to help you save money and get better gas mileage. Such a product has appeared on the horizon; Ethos Gas Reformulator. Websites and forums have popped up seemingly overnight touting the benefits of this new product. According to the company's press consumers who have used Ethos Gas Reformulator have reported savings of up to 19% off of their fuel costs as well as a 30% reduction in hydrocarbon emissions. Read on here to see if this is the Holy grail of fuel additives or just another heap of 'fast cash' hokum. How Will Demand for Ethanol Affect Food Prices? Lester Brown of the Earth Policy Institute writes, “We are witnessing the beginning of one of the great tragedies of history. The United States, in a misguided effort to reduce its oil insecurity by converting grain into fuel for cars, is generating global food insecurity on a scale never seen before. The world is facing the most severe food price inflation in history as grain and soybean prices climb to all-time highs.” This taken alone could be seen as one man’s opinion about the process of using staple foodstuffs to create fuel. However at a time when the economy already seems to be in crisis, the process of taking food traditionally meant for our dinner table to put in our gas tanks, put’s people at odds with themselves. Corn, soybeans and wheat have all reached or breached all time highs for price per bushel. As a result the food items made from these products have seen significant increases in cost. The drastic increase in prices in America has been less evident than in countries which are less developed. For instance, in Pakistan flour prices have doubled. In industrialized nations our mechanization tends to soften the blow but even that is changing. In recent months America has begun to see its share of food inflation. The cost of milk has gone up about 30% while bread costs are up over 15%. In Italy pasta prices are up 22%. Add to this the weather woes that have befallen the Midwest where a large part of the American corn, wheat and soybean crops are grown. Currently a great many of those crops are underwater and it remains to be seen if any can be salvaged. According to Agribusiness experts some 3 million acres of corn was destroyed by the flooding. Because of the damage to the corn crops from which a great deal of the livestock feed is made, the cost of beef and pork will also see a rise in costs. The demand on corn for ethanol production was already creating a scarcity effect. Add to that the recent related crop catastrophes and it is easy to see how Mr. Brown’s words take on some credence. Historically food has never been in the same economic ball park with fuel. It’s sort of like if they started making bullets out of butter. It would change the whole scheme of things. Now because of the either or scenario. Whether grains are usurped by the energy economy has to do with the perceived value. If the energy industry is willing to pay more to turn grains into ethanol then the world will suffer as the grain stores go to the highest bidder. The energy industry has the deep pockets so they can pay well above what the market will bear. That does not appear to bode well for food economies. According to the Earth Policy institute, projections show the number of hungry people increasing to 1.2 billion by 2025. Lest you think the rising food prices are just about hunger, understand that a hungry person is prone to instability. Take a nation of hungry people and you have problems. Already countries are imposing sky high tariffs and in some cases banning exports out right. In some places social unrest comes as a result of the frustration at the rising costs. In 2007 Mexico saw the tortilla riots, where some 75000 people protested the rising cost of tortillas. It seems laughable but beneath the surface it is about the price of corn and the trade off that is being made. People across the world depend on products made of corn. As ethanol demand increases, corn prices rise and food makers can not compete. In addition to Mexico, Italy saw pasta protests and in Jakarta, some 10,000 Indonesians protested the doubling of soybean prices that has raised the price of tempeh. Tempeh is the national staple of Indonesia. In Chongqing, China, a store offered a sale on cooking oil. Currently in China cooking oil prices are at an all time high. So many people showed up for the sale that there was a stampede. Three people were killed and 31 injured. 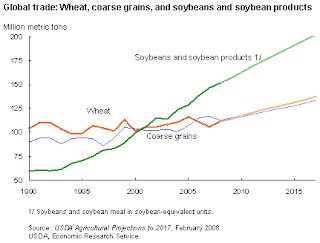 As it turns out, by continuing to subsidize the conversion of grain into ethanol, we are in effect causing a rise in our own food prices. It may be time to look at an alternative to the alternative before things really get out of hand. Google is currently working on creating a world wide transit guide that will allow you to plan your public transportation route using google. The only have limited coverage, but they are working with the transit authorities in various cities to get their information incorporated. To check out what cities, states and countries they have already set up click here. If gas prices have you singing the blues, let me make a case for public transportation. Even with the Saudi’s recent agreement to increase oil output, gas prices show no signs of dropping or leveling off. The rising gas prices all but dictate that we take drastic measures to decrease our dependence on foreign oil. One way to do that is to start to take public transportation. I’ve never been skinny but before I had a car and I depended solely on mass transit to get around, I was significantly slimmer. Part of the reason for this is that the bus encourages walking. Case in point; if the bus that passes on your street takes you to another stop where you have to get off and wait on another bus, but you know you can simply catch the bus that you want by walking two blocks over, then you’re more inclined. In the long run this translates into a slimmer physique and more energy. Just in case you’ve seen any of the Youtube videos outlining the horrors of bands of roving ADHD teens harassing unassuming bus riders, take heart. That doesn’t happen nearly as much as you might be led to believe by Youtube. I believe it’s a propaganda tactic used by oil companies to scare people into driving and continuing to pay exorbitant prices for gas. That is my conspiracy theory and I’m sticking to it. Anyway, people who ride the bus are, for the most part, overworked and underpaid so they are far too tired to harass you. Even the one’s who look threatening are usually just exhausted. It’s usually easiest just say hello and see how it goes from there. Some of the best friends I have, I met riding the bus. While, all across the country, the cost of riding public transportation has gone up, it pales in comparison to the cost of a gallon of gas. According to ICF International, a driver saves about $1400 a year by taking public transportation. Add to that their findings that using public transit saves about 1.4 million gallons of gas per year and it’s easy to see how that could over time and with increasing ridership start to really go a long way towards decreasing our dependence on foreign oil. Check out the American Public Transportation Associations Transit Calculator to see how much you can personally save based on your car’s mpg. Transit authorities all over are utilizing cleaner burning hybrids. These buses make far less of an impact on the environment and their decreased emissions produce less CO2 in the atmosphere, thereby mitigating the greenhouse effect. Whether you think Al Gore’s Global Warming message is all propaganda or not you can’t argue with the fact that we’ve been having some weird and wacky weather. I subscribe to the ‘err on the side of caution’ theory. It’s worth it to make the effort to insure the earth doesn’t just spontaneously combust or flood from all the run off from the melting polar ice caps. That may be an extreme statement but if it makes the point, so much the better. Usually by the time people make it in from navigating traffic and putting up with other drivers, they are plum tuckered out. Wouldn’t be great to leave the driving to someone else? This is especially nice if you live in outlying areas and get to ride the plush park and ride buses which occasionally come with drop down DVD screens and a movie. Public transportation gets a bad rap but it is reliable, efficient and cost effective and as gas prices continue to rise it will become a necessity. I'm a stand up comedian, actor and filmmaker (directing, screenwriting and editing).